The premise for this fake DMCA episode is really simple and tidy. 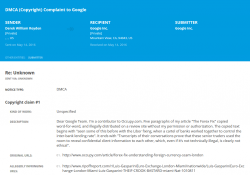 The idea was to make Google believe that an article from a very legit site www.occupy.com (posted in 2014) was published on Ripoffreport.com in 2016 without consent. Within a week, the author of the original post from occupy.com happened to check for plagiarism on a 2-yr old article, found that one instance of IP theft, and submit a DMCA notice. It does not even sound like a convincing story, and Google did not honor this notice. However, we must not forget that in this attempt to suppress a complaint on Google, these scammers committed some serious crimes, including perjury, impersonation and identity theft. By impersonating Derek Royden (occupy.com) and pitching him against Ripoff Report, they put him and occupy.com under a threat of a civil action and perjury. We are getting in touch with occupy.com and ripoffreport.com who might want to take this seriously and publish their own thoughts regarding this, not to mention taking action to prevent this from happening again. 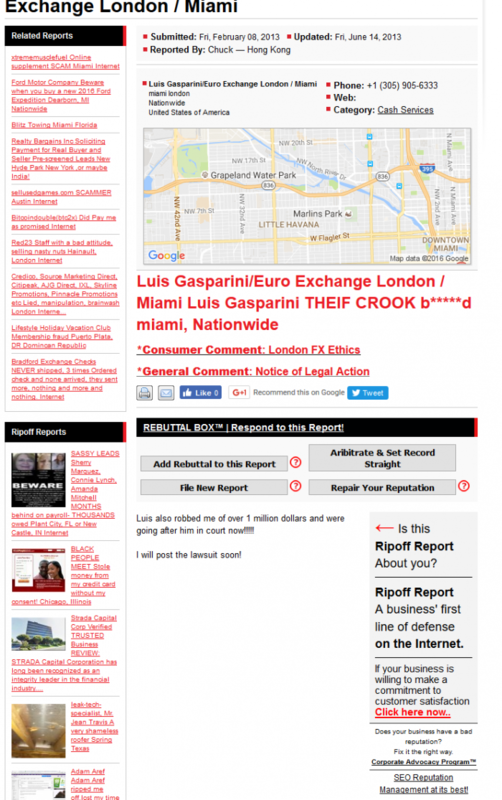 It all started with a 25-word complaint posted against Luis Gasparini and Euro Exchange London on Ripoff Report, around 3 years ago. 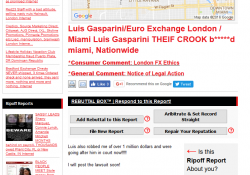 For all these years, this Ripoff Report ranked high on Google, and we’re sure Luis and his team would have tried to do everything in their powers to suppress this from Google using SEO and ORM techniques. They did took legal action in 2013, and the report was finally removed from Google search after an ex-parte court order (which we’re looking into). However, sometime before the Ripoff Report was taken down on effect of a court order, Luis Gasparinin hired a service which promised him to do the same, via DMCA route. And they tried their best…. 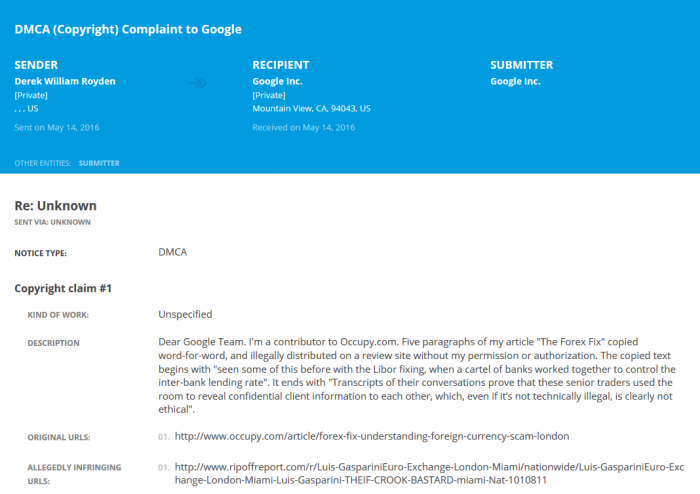 EDITOR’S COMMENT : For those who might ask – ‘why and how do we interject that ‘Luis Gasparini’ has something to do with this fake DMCA. Couldn’t it be a coincidence ?’, we will say this – When someone goes and creates a whole new fake news site, falsifies his/her identity and submits fake DMCA to try and de-list some very targeted content on Google, it signals intent and a plan. It is obvious that ‘Euro Exchange London’ or someone they hired was directly involved in this crime. 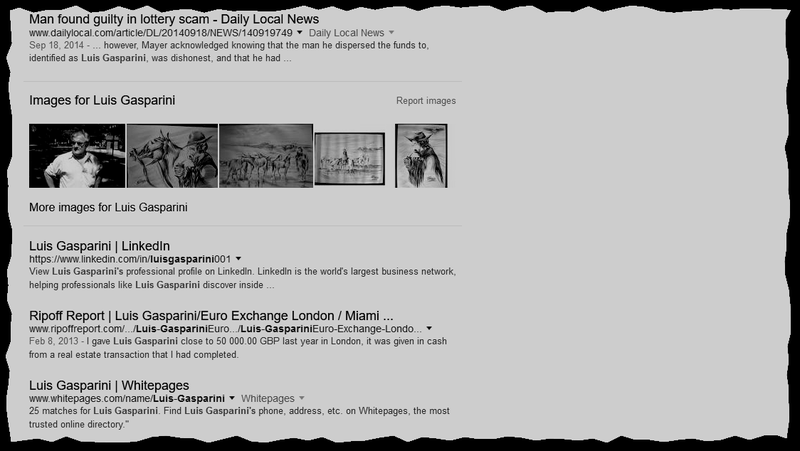 Luis Gasparini also cannot plead ignorance in this matter, since this notice on Google search is hard to miss, really. Just saw this now, whoever did this didn’t even get my name right. I have no problem with ripoff report or any legitimate site using my content as long as proper attribution is given!